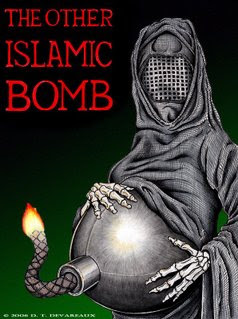 Muslim hate fanatics plan to take over Britain by having more babies and forcing a population explosion, it has been revealed. The swollen Muslim population would be enough to conquer Britain from inside, they claim. Fanatics told a meeting of young Muslims on the anniversary of the 9/11 atrocity, that it would then be easy to impose Sharia law on the population, the Sun newspaper reported. Speaking at a meeting in London, Anjem Choudary, right-hand man of exiled preacher Omar Bakri Mohammed, said: "It may be by pure conversion that Britain will become an Islamic state. We may never need to conquer it from the outside." According to the UN, global population is supposed to peak at about nine billion in 2050, then level off and start to decline. If you're one of those eco-fetishists who think of humanity as a species, then that nine billion is the number to watch, up from six billion at the turn of the century. But, if you don’t think of the world as one unified global parking lot, you're less interested in the big number and more in its constituent parts: On the road to that nine billion, almost all the increase in global population will come from Islam and sub-Saharan Africa - ie, "the likes of Afghanistan and Iraq, Algeria and Morocco, [the Muslim minority of] India, Palestine, Congo and Somalia". Between 2010 and 2030, the ummah - the worldwide Muslim community – is predicted to increase from somewhere between a fifth and a quarter of the global population to one third of humanity. I would call that a pretty conservative estimate, but let's stick with it. Muslims would be one in three of the world’s population, yet, aside from a handful of rapacious emirs and a few thousand layabout Saudi princes gambling and whoring in Mayfair and Macau, enjoy almost none of its wealth. They'll be "citizens" of countries which have done a cracking job of killing almost all human progress of the modern age. In the first decade of the 21st century, Niger, which is over 90 per cent Muslim, increased its population by almost half – from just over ten million to just over 15 million. In 2000, half a million of its children were estimated to be starving, but hey, that's no reason not to add a few million more. Its population is predicted to hit just under 100 million by the end of this century – in a country that can’t feed a people one-tenth that size. Is it likely that an extra 90 million people will choose to stay within Niger? The "Muslim Demographics" video was thoroughly debunked way back in 2009. Anyone still presenting this video in 2010 is not just ignorant: THEY ARE WILLFULLY LYING TO YOU.